The final round has begun. Everyone gets one last turn before the game ends. I recommend you use it to claim a route and score some last-minute points. It is currently @smol Kat's turn. You can Claim a Route or Draw Destination Tickets. It is currently @Random User 's turn. You can Claim a Route or Draw Destination Tickets. Claim Sea Cottage - Mt. Moon with 4 purples and two rainbows. It is currently @Calamity Panfan's turn. You can Claim a Route or Draw Destination Tickets. That's the game! Now to tally everybody's final scores. Congratulations to Panfan, the winner! That ended up being a really close game. Thanks to everyone for participating, I hope it was as fun to play as it was for me to host. Perhaps after taking a break for a few weeks, I'll host another round of this, if anyone's interested then. Mistakes were made. 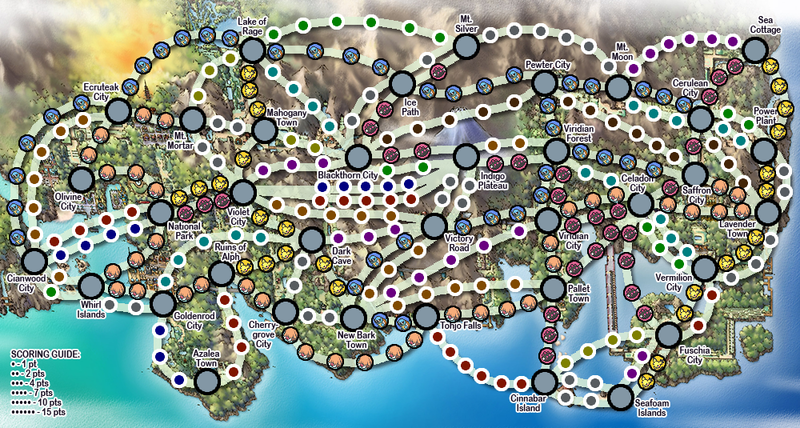 I wasted too many turns and left too many points on the board by going for routes of 2-4 instead of routes of 5-6. If I had gone Ecruteak to Cianwood along the outside, I probably would have had enough turns to get across the map and finish my route to Fuschia. Hey-ho, I might host another round of this if enough people are still interested. There's room for up to five players.